Former SFSS board member calls SFSS "a hot mess" and "a very adversarial place." On Thursday, February 13, the Simon Fraser Public Interest Research Group (SFPIRG) held a town hall to discuss space allocation in the new Student Union Building (SUB). 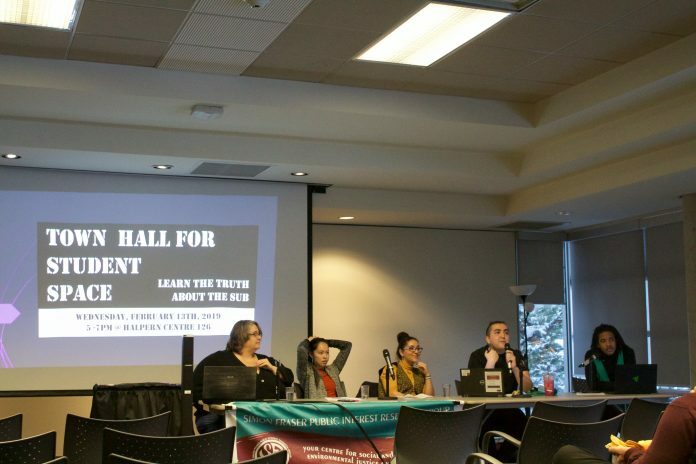 In addition to providing an in-depth overview and background on the situation, the event involved discussion from four panelists, including a previous SFSS board member who was present during the early stages of the SUB decision-making process. The first panelist to speak after this was Maisaloon Al-Ashkar, an SFU alum who has been involved with SFPIRG over the last four years as a volunteer and later as a board member. Giovanni Hosang, SFU student and President of SFU Students of Caribbean and African Ancestry (SOCA) spoke next. He talked about how he found a home with SOCA, which is one of the Rotunda groups that has not been granted space in the SUB. The next panelist was Kathleen Yang, former SFSS VP External Relations during 2015–16 term — a term Yang referred to as “the year the board secured an 85% vote in favor of obtaining a $60 million dollar loan for the purpose of constructing a student union building.” According to her bio, she also served on the Build SFU working group and was, for a while, part of the sublease negotiations with SFPIRG. She explained that her board in the year of 2015-16 did not prioritize figuring out space allocation for the reason that they were not sure if they could even build the SUB at the time, as they had yet to apply for bank loans. The last panelist was Steven Hall, a current SFU student and former Langara student. Hall experienced a similar situation previously at Langara, where the LGBTQ+ space was taken away. Although Hall described having a home on campus that was strictly within the urban Aboriginal spaces at Langara, Hall mentioned having friends who were engaged in the Langara LGBTQ+ spaces who were deeply affected by the closure.